EURUSD is moving in a nice downward trend broker below 1.3600 level as expected. 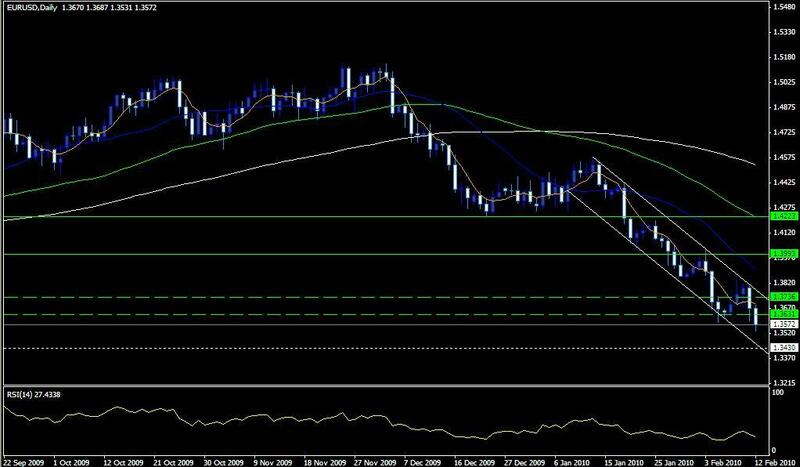 The trend seems to carry on in the next week as well but we might see some retrace by EURUSD and traders will be looking to enter the market once EURUSD rise to levels around 1.3630 level. The retracement can extend to 1.3735 but overall the downward trend is looking good for next week as well. RSI is although a bit on lower side but retracements by EURUSD is allowing it to open up enough each time to have create enough space for EURUSD to take a dip. RSI seems to have enough to make it to 1.3430 during next week. Sell EURUSD @ 1.3630 and Sell again @ 1.3735 (If required) for Profit Level @ 1.3430 with Stop @ 1.3800 level.